Composer’pianist’bandleader Omar Sosa was born in 1965 in Camagüey, Cuba’s largest inland city. At age eight, Omar began studying percussion and marimba at the music conservatory in Camagüey; in Havana, as a teenager, he took up piano at the prestigious Escuela Nacional de Música, and completed his formal education at the Instituto Superior de Arte in Havana. Among his influences, Omar cites traditional Afro’Cuban music, European classical composers (including Chopin, Bartok, and Satie), Monk, Coltrane, Parker, Oscar Peterson, Herbie Hancock, Chick Corea, Keith Jarrett, Chucho Valdés, and the pioneering Cuban jazz group Irakere. Moving in 1993 to Ecuador, Omar immersed himself in the folkloric traditions of Esmeraldas, the northwest coast region whose African heritage includes the distinctive marimba tradition. He relocated to the San Francisco Bay Area in 1995, and soon invigorated the Latin jazz scene with his adventurous writing and percussive style. Annually performing upwards of 100 concerts on six continents, Omar has appeared in venues as diverse as the Blue Note (New York, Milan, and Tokyo), Carnegie Hall’s Zankel Hall, Boston’s Museum of Fine Arts, Chicago’s Museum of Contemporary Arts, the Philadelphia Museum of Art, the Detroit Institute of Arts, the Walker Art Center, the Getty Center, London’s Barbican and Queen Elizabeth Hall, Glasgow’s Royal Concert Hall, and Berlin’s Haus der Kulturen der Welt; festivals including Monterey Jazz, JVC Jazz, Montreal Jazz, Marciac Jazz, North Sea Jazz, Helsinki, Grenoble Jazz, Montreux Jazz, Naples Jazz, Ravenna Jazz, Roma Jazz, Spoletto, WOMAD, and Cape Town International Jazz; and universities on several continents, including a visiting artist fellowship at Princeton University in March 2008, and a visiting artist residency at Dartmouth College in April 2008. Omar will return to Dartmouth College for a second artist residency in February 2011. Mr. Sosa received a lifetime achievement award from the Smithsonian Associates in Washington, DC in 2003 for his contribution to the development of Latin jazz in the United States. He has received two nominations from the BBC Radio 3 World Music Awards, in 2004 and 2006, both in the ‘Americas’ category. In 2003 Omar Sosa received the Afro’Caribbean Jazz Album of the Year Award from the Jazz Journalists Association in NYC for his recording Sentir; and a nomination from the Jazz Journalists Association for Latin Jazz Album of the Year in 2005 for his recording Mulatos. Omar Sosa received an orchestral commission from Yerba Buena Center for the Arts in San Francisco and the Oakland Easy Bay Symphony, supported by grants from the Rockefeller Foundation and the MAP Fund (Multi’Arts Production Fund). During 2001’2002, Mr. Sosa composed a 45’minute work in three movements for symphony orchestra entitled, From Our Mother, which received its world premiere in January 2003 by the Oakland East Bay Symphony under the direction of Michael Morgan. In 2009, Mr. Sosa received an orchestral commission from the city of Girona, Spain and the Festival de Músicas Religiosas y del Mundo de Girona. The 20’minute work for symphony orchestra, entitled Oda Africana, received its world premiere in July 2009 by the Jove Orquesta Athenea, conducted by Lluis Caballeria. Also in 2009, Mr. Sosa received a commission from the Barcelona Jazz Festival to present a tribute to Miles Davis’ Kind Of Blue recording, featuring Afro’Cuban interpretations of the seminal Davis work on the occasion of its 50th anniversary. The project was performed at L’Auditori in Barcelona in November 2009. In 2008, Omar Sosa received funding from the National Endowment for the Arts in conjunction with Yerba Buena Gardens (San Francisco) and the San Francisco International Arts Festival to present a new Omar Sosa Quintet featuring American roots vocalist Tim Eriksen. This collaboration resulted in the 2009 CD release on Half Note Records, Across The Divide, recorded live at the Blue Note Jazz Club in NYC. The project received a GRAMMY nomination for Best Contemporary World Music Album, and a Latin GRAMMY nomination for Best Instrumental Album, both in 2009. For May 2011, Mr. Sosa has received further funding from the National Endowment for the Arts in conjunction with the Jazz School in Berkeley, California and the San Francisco International Arts Festival, to present a series of workshops with noted Latin jazz percussionist, educator and historian, John Santos, as well as a Festival performance in San Francisco with his primary touring ensemble, Afreecanos Quartet. 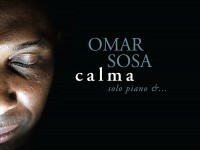 Mr. Sosa’s recording career began in 1997 with the release of his first solo piano recording, Omar Omar on the Oakland, California’based record label, Otá Records, and has continued with the release of 22 CDs as a leader, resulting in five GRAMMY nominations. These include a 2002 GRAMMY nomination and Latin GRAMMY nomination for Best Latin Jazz Album for the CD Sentir; a 2005 GRAMMY nomination for Best Latin Jazz Album for the CD Mulatos, featuring Cuban saxophone and clarinet master, Paquito D’Rivera; and the two nominations for Across The Divide in 2009. Omar works with an array of African, Arabic, European, Indian, Latin, and North American musicians. Among his many associations are drummers and percussionists Steve Argüelles, Julio Barretto, Mino Cinelu, Miguel “Angá” Diaz, Marque Gilmore, Trilok Gurtu, Marcos Ilukán, Ramiro Musotto, Gustavo Ovalles, Pancho Quinto, Adam Rudolph, John Santos, Carlos “Patato” Valdés, and Orestes Vilató; singers Tim Eriksen, Lázaro Galarraga, Marta Galarraga, El Houssaine Kili, Xiomara Laugart, María Márquez, Will Power, Mola Sylla, the Tenores San Gavino de Oniferi ’ Sardinia, and Dhafer Youssef; trumpeter Paolo Fresu; and woodwind masters Paquito D’Rivera, Luis Depestre, Leandro Saint’Hill, and Mark Weinstein. A major new project bears the fruit of Omar’s first big band collaboration, working with composer Jaques Morelenbaum and Hamburg’s North German Radio (NDR) Bigband. Recorded in 2007 and 2008 at the NDR studios in Hamburg, it features Jaques Morelenbaum arrangements of material from the Omar Sosa CDs Spirit Of The Roots (1999), Bembón (2000), and Afreecanos (2008). Jaques Morelenbaum has arranged for Antonio Carlos Jobim, Gal Costa, Gilberto Gil, Caetano Veloso, and Cesária Evora, among many others. Omar Sosa’NDR Bigband performances were held at the Banlieues Bleues festival in Paris and the NDR studios in March 2010; and will be presented again by the Barcelona Jazz Festival in November 2010 at that city’s famous Palau Música Catalana, with Jaques Morelenbaum conducting. New performing pursuits include a trio with noted Italian trumpet player Paolo Fresu and master Indian percussionist Trilok Gurtu. Notable video productions include Light In The Sky, filmed in Salvador de Bahia, Brazil and directed by Aitor Echeverria (from the 2008 CD release Afreecanos), and the recent DVD release of Omar Sosa’s 2007 Java Jazz Festival performance in Jakarta, Indonesia. For film and television, Omar Sosa collaborated in 2008 on the soundtrack for the PBS documentary, The Judge and the General; completed the soundtrack for the 2010 film The Last Flight of the Flamingo, produced by Fado Filmes in Lisbon, Portugal, and based on Mia Couto’s famous novel about Mozambique; and is currently working on the soundtrack for noted French film director Philippe Lioret’s new film, All Our Desires. Mr. Sosa also contributed a musical excerpt to the 2006 Andy Garcia film, The Lost City. For more information, please visit http://www.omarsosa.com.